Many Zune owners might have the same questions as above ones. They want to play iTunes music on Zune but have no idea how to do this since iTunes music files are saved in M4A/M4P format, and some are even DRM protected. Well, in this guide, we would like to provide you effective solutions how to play iTunes music on Zune player with different tools. Widely known to all, iTunes is developed by Apple Inc. for file management on both Mac and Windows computers. It’s actually a combo that integrates media player, media library, Internet radio broadcaster, and mobile device management application. You could purchase and download music from iTunes music store, and then listen to iTunes music via the internal player within iTunes. It’s worth mentioning that before 2007 music files purchased from iTunes music store were saved in M4P format with DRM protection, and after then most iTunes music has been DRM free. On the other hand, Zune is a portable digital media player from Microsoft. Zune player supports various file formats, including .WMA, .MP3, .AAC, .JPEG and .WMV. 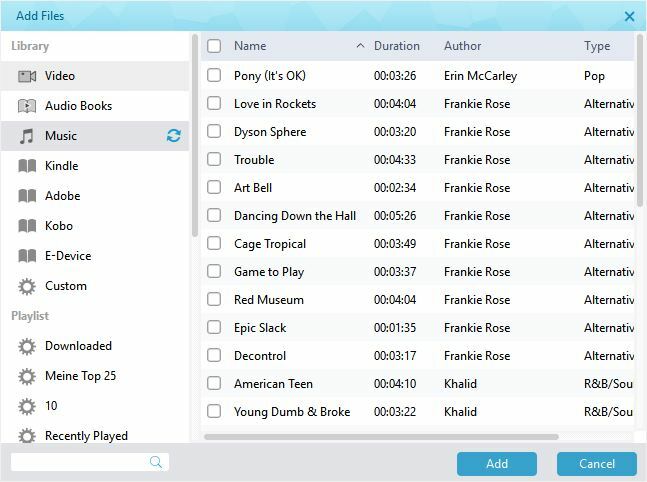 Therefore, if you want to put music onto Zune player, you have to make sure that these music files are saved in either WMA, MP3 or AAC format. That’s why you can’t directly transfer iTunes music to Zune for playback since iTunes music files are saved in M4A/M4P format as mentioned above. Then, how to play iTunes music on Zune player? Check the below content to get a satisfactory solution. As mentioned above, some iTunes music files are actually DRM protected. Therefore, there is another barrier for you to play iTunes music on Zune – the DRM removal. That means you have to remove DRM protection upon iTunes music first and then convert iTunes music to MP3 for Zune. Luckily, you get Leawo Prof. DRM, a professional iTunes DRM removal and converter that could remove DRM upon iTunes music and convert iTunes music to MP3 files with ease. Download and install Leawo Prof. DRM on your computer and then follow the below steps to learn how to transfer iTunes music to Zune with Leawo Prof. DRM. Launch Leawo Prof. DRM after installation and then click the "Add Files" button. On the popup "Add Files" window, choose songs you want to transfer from iTunes to Zune in the "Music" tab, and then click "Add" button. 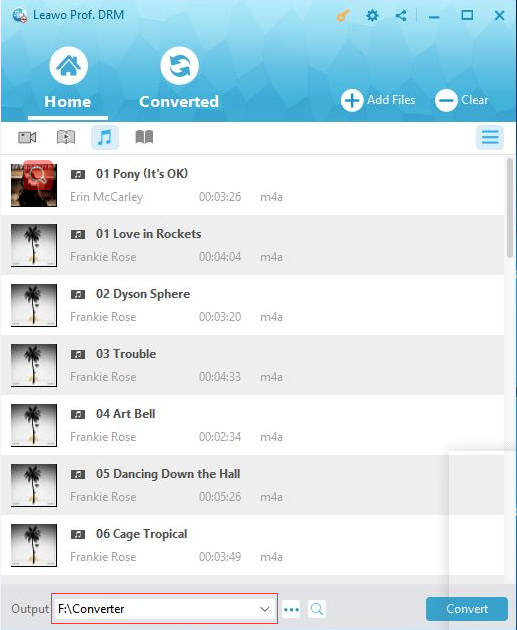 Leawo Prof. DRM would help you convert iTunes music to MP3 files. After loading iTunes music files, click the pencil icon in each loaded music file title and then set parameters of output MP3 files. You could determine Channels, Sampling Rates and Bit. On the main interface, move mouse to the bottom and click the Output button to set an output path. Finally, click the bottom right “Convert” button to start to convert iTunes music to MP3 files for Zune player within this Prof. DRM. Note: You need to authorize your computer with Apple ID to start the converting if it’s the first converting. Just log in with your Apple ID information. After authorizing, Leawo Prof. DRM would start to convert iTunes music to MP3 files for Zune player immediately. When the conversion finishes, you could then open the folder you’ve set in Step 3 and get the final converted iTunes music files (now in MP3 format). Then, copy and paste the converted iTunes music to Zune player for unlimited playback. 1. In iTunes, create a new playlist with all the music you want to put onto Zune player in it. 2. Add the protected songs to your playlist until you have 72 minutes of music. 3. On the menu bar of iTunes, click “Edit > Preferences” successively. 4. Open the “Advanced > Burning” tab, and then click the radio button next to the “Audio CD”. 5. Click the “Burn Disc” button to turn your iTunes music to CD disc. That means you have to insert a blank writable CD disc into the drive beforehand. 6. Upon completion of burning the disc, rip the songs to MP3 using Windows Media Player. 7. Open the Zune software and sync the newly created MP3’s to your Zune device. This method is also useful in converting iTunes music to Zune player. However, you could easily see that you can only convert iTunes music in less than 72 minutes to Zune MP3 files at a time, and you need to firstly turn it to CD disc, and then rip the CD disc to MP3 files before you could finally put the iTunes music onto Zune player. Obviously, this method is free of cost but time assuming and complicate. What’s more, Leawo Prof. DRM could handle batch conversion upon those DRM protected iTunes music files.